The University of North Carolina Board of Governors today approved a proposal from The University of North Carolina at Greensboro (UNCG) for the establishment of a Millennial Campus designation, creating opportunities for growth, development of innovative academic experiences, and the creation of unique public-private partnerships for the university. With the Millennial Campus designation, UNCG can enter into arrangements with private-sector entities to develop university property or facilities for new ventures. The approval designates two areas of the campus as new districts for future development: one primarily along Gate City Boulevard, which will focus on Health and Wellness, and the other along Tate Street, which will focus on Visual and Performing Arts. These areas of focus are directly tied to UNCG’s strategic plan and enable the university to leverage existing assets and resources as it explores future opportunities. Collectively, the Millennial districts will encompass approximately 73 acres of existing campus property, as previously outlined in the Campus Master Plan. The Health and Wellness District is uniquely positioned to encourage and stimulate applied research and education through the university’s numerous community-based partnerships with organizations like Cone Health, High Point Regional Health System, and Well∙Spring Services, Inc. Further, the ability to leverage university assets, including new Spartan Village student residences (open August 2017), the Leonard J. Kaplan Center for Wellness (built in 2016) and the future Nursing and Instructional Building, provide considerable opportunities to advance health promotion, quality of life, human development, and economic well-being in the Piedmont Triad and beyond. Several existing or planned UNCG buildings dedicated to nursing, science education, and research, not directly on Gate City Boulevard, are also included in the Health and Wellness District. The Visual and Performing Arts District along Tate Street will encompass approximately 20 acres. The newly combined UNCG College of Visual and Performing Arts is already a vibrant community of artists with approximately 1,500 students, 100 internationally recognized faculty, and excellent facilities. It produces more than 350 performances, exhibits, lectures, and other community events annually. 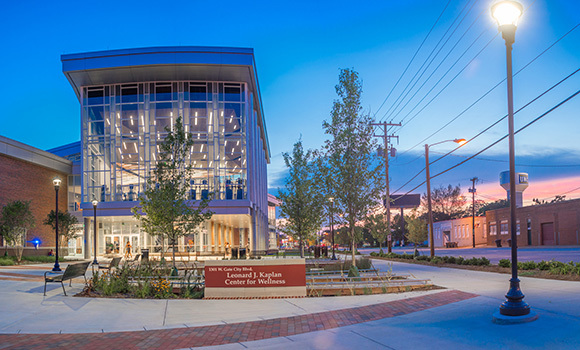 In addition, by maximizing arts-related facilities, like the campus’ Weatherspoon Art Museum, UNCG Auditorium, and Taylor Theatre, the university can build on its strengths and cultivate public-private partnerships to further develop opportunities for learning, teaching, and service to the Greater Greensboro community.